I was so privileged to be able to participate in the 9th Annual Tea Cup Exchange through Stephanie's beautiful blog, The Enchanting Rose. You can find the rules of the exchange here and a broad overview of what happens here. Basically, you sign up and get sent someone's address. 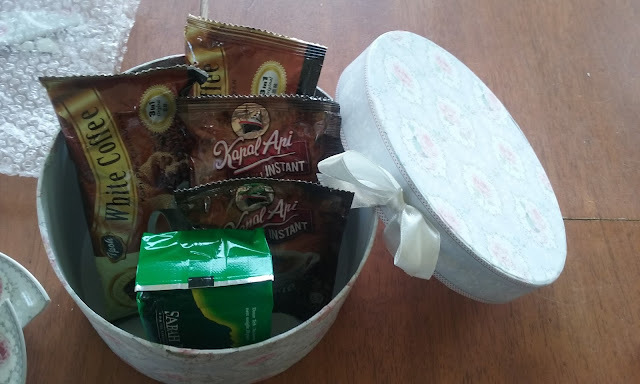 You send that person a package containing a tea cup and saucer and another item (such as tea or coffee). You can also add anything else to your package that you like. So you send a package, and someone else from somewhere in the world sends you a package. Lots of women from all over the world participate. It was my first time participating and it was so much fun! 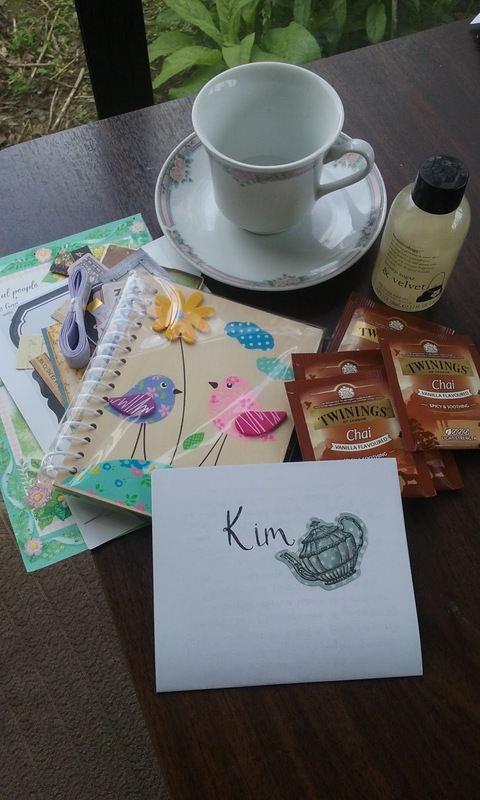 A pretty flowery teacup and saucer, a pretty notebook with some oh-so-cute little birds and flowers on it, some scrapbooking supplies, some Twinings Chai vanilla tea, a body wash/scrub and a wee note introducing myself. So I posted that off in a little parcel and waited impatiently to receive a parcel from someone else. Well I didn't have to wait for long before that arrived! The lovely lady who 'drew my name' was Lillie who lives in Malaysia and blogs here (her blog is in English and it's really interesting!). The whole package! :) see the cute wee card with CUPCAKES on it on the left! The gorgeous teacup and saucer Lillie sent me. My joy in opening this package was dampened to discover that the saucer is rather smashed. :/ Unfortunately when you send parcels overseas you can't make sure they don't get dropped in transit! It was wrapped so carefully in bubble wrap but I guess even bubble wrap isn't perfect. So I'm disappointed the saucer is broken. I thought about glueing it together but sadly there were too many pieces (I reconstructed it a little for the photo, from the angle it's taken you can't really tell!). The teacup is beautiful though and I'll definitely use it without the saucer. This cute little spoon and Japanese tea plate. What's a tea plate? I'm not sure! Is it an alternative for a saucer? Hmm, I'm sure I'll find a use for it! "The tea plate was politely drawn by Japanese craftsman's hand work. 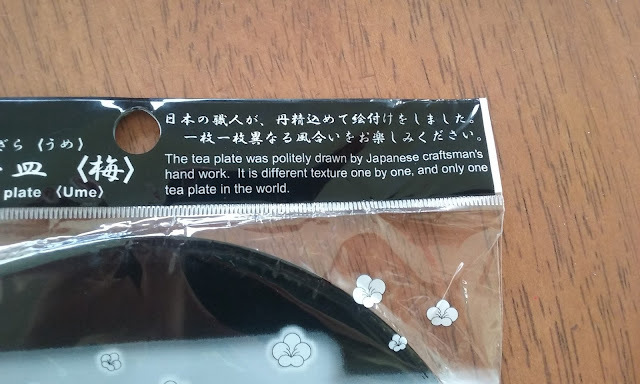 It is different texture one by one, and only one tea plate in the world." Have you ever participated in anything like this? 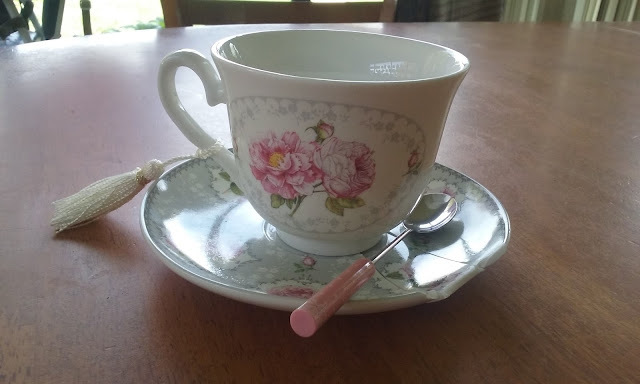 I am thrilled that you also participated in Stephanie's wonderful tea cup exchange, Bonnie! It is fast becoming THE event in the beautiful world of blogging! I sadly had to miss this one, but I too am keeping an eye out for the next exchange! What a lovely package you sent to Kim...she is so sweet and that reminds me...I haven't paid her a ''visit'' in awhile! I know she must have been so happy to open your parcel of teacup happiness! And oh, what a sweet package you received from Lillie! How upsetting about the saucer...it is so pretty too! I am always so concerned that my parcels will either get damaged or lost in transit...sadly so! What sweet goodies she included for you as well - a tea plate? Something I've never heard of! Oh, love the box too! 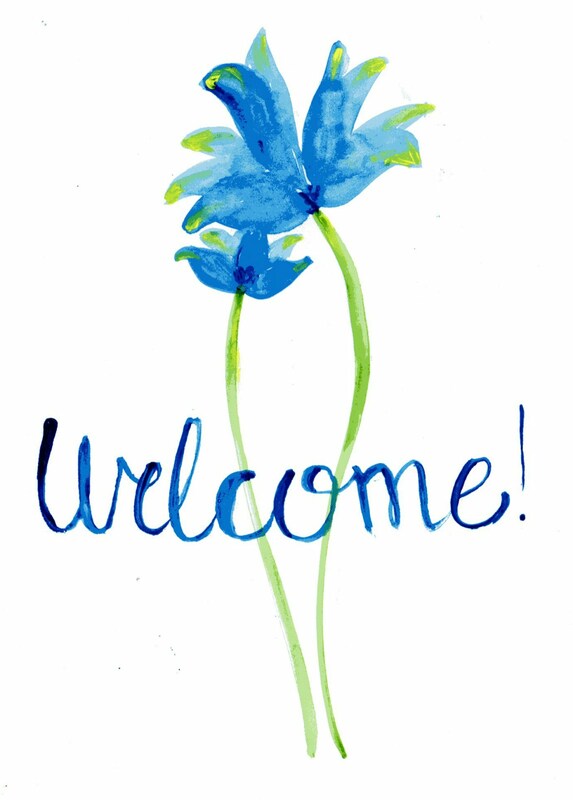 I so enjoyed reading your post, Bonnie! Thinking of you as you count down the days till your departure...how exciting! I found out about it from the link button on your blog, Kelly-Anne! :) Thanks for sharing the info! It was so much fun. I so enjoyed reading your letter... yesterday I wrote one in reply and popped it into the mail! Don't worry too much about replying to it massively urgently since I'm leaving Nov 13 and I don't think it will get here in time! But I'll look forward to a letter waiting for me when I come home! Oh dear, Bonnie, I am sadden that the saucer got smashed. I am truly sorry and that was my biggest worry. I am so sad. Oh Lillie, it really is fine! Don't be saddened. You are so sweet! I absolutely LOVE the rest of the package and that definitely makes up for the smashed saucer. :) It was wrapped so carefully... I don't know how it could be wrapped any better. Ah, I've heard about the tea cup exchange before! That's wonderful you took part in it! Although it must have been disappointing to find the saucer broken. It was disappointing but everything else was so wonderful I don't mind at all! That is so cool! It sounds like something I'd love to participate in next time! It really is awesome. You make some great friends! Apparently there will be another one in March/April. Both of those packages are lovely. Love them. Me too! :D Thank you for commenting, Deborah. Everything is so beautiful! And the note on the tea plate made me smile too. Perhaps it is used to set a used tea bag or spoon on? That way you can keep your saucer clean? Either way, it quite pretty. Those are great thoughts, Skyeler. I will have to have another look at it! :D Thank you for your comment. I know, it was hilarious! :D Yes I am so enjoying using the gorgeous tea cup despite the lack of a saucer. It was such a neat tea cup party! It really is so neat! 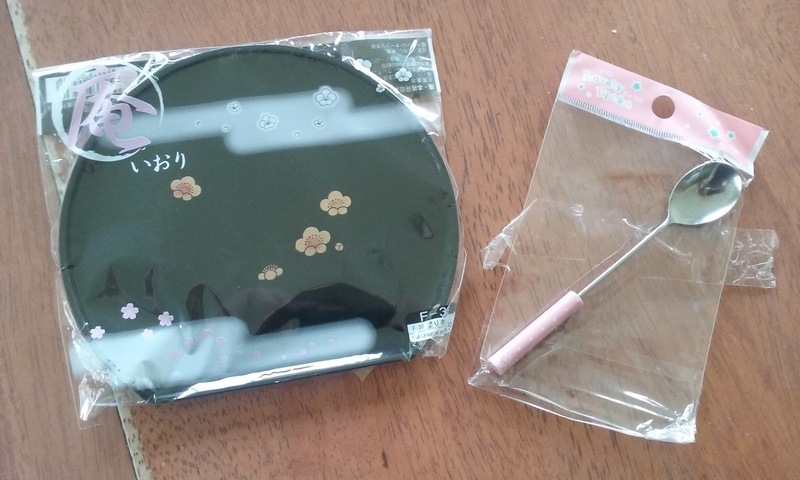 You have received a beautiful package, too bad about your saucer though. What a darling little soon. I have indeed! It's a shame but these things happen. :) The spoon is even cuter in real life. Dearest Bonnie, what a joy and pleasure to see what you sent and received. Both packages are lovely. The tea cup from Lillie is quite the beauty though I am sorry to hear the saucer arrived broken. Sweet Lillie was heartbroken when she found out and when I read your comment on her blog I was truly amazed at you kind response. You have a very sweet spirit, my dear. 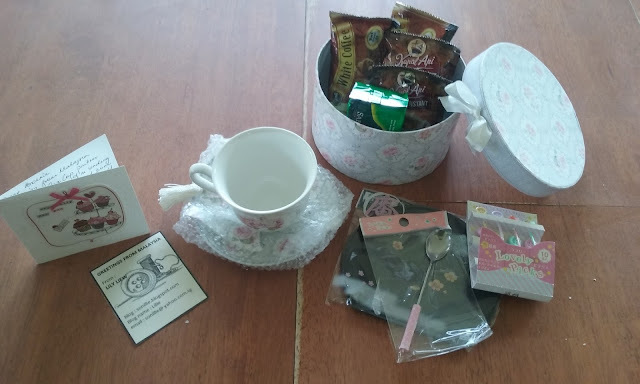 Thank you so much for hosting such a wonderful tea cup exchange! :) <3 It was really lovely and a neat thing to participate in. I know... she is so kind and sweet to be disappointed with me about the saucer! These things happen, unfortunately. I'm so glad I participated though! It was my first one, too, Cindy! :) It was lovely. Thank you for stopping by! So sorry about the smashed saucer. The cup is lovely and it can be a lot of fun to mix and match cups and saucers. I giggled at the translation. Happy Tea Day! Yes, it can indeed be fun to mix and match cups and saucers! :) Thank you for your comment! I had to google Japanese tea plate ... simply a plate for your snack to eat with your tea ;) You received such pretty things from Lillie. That teacup is a beauty. I'm sure you'd be able to find an orphan saucer to go with it at a thrift store? Yay! Now I get an excuse to have snacks with my tea! Thanks for stopping in, Wendy! Interesting concept...."drawing politely"; I wonder what that means?? Your teacup is so pretty. What a pity the saucer was broken. I always hold my breath when sending teacups in the mail....one never knows. You certainly received the prettiest of gifts and I love the ones you gifted to Kim. Thank you for stopping by, Kim! :) I was so blessed by what I received and I do hope Kim likes what I gave her. Hi Bonnie - you received some wonderful treasures! I am *so so sorry* that your saucer was broken upon arrival - it had so far to go, such a shame, though. You know what I would do? I'd go to a craft store and buy a candle making kit and make my hardy teacup into a lovely and perfect candle holder! You could keep it in your bath or bedroom then when you are relaxing to remind you of a caring friend. Oh Michele, that is such a neat idea! :) I just might do that. Thank you for stopping in and saying hi! The packages that you sent and received are both wonderful! I'm sorry to hear that the saucer did not make it intact...perhaps it can be used for a mosaic project? Now you can have fun hunting for a replacement saucer. I've always found mismatched tea sets charming! Mismatched tea sets are so cute! :) Charming is a great word to describe them. I'll be on the lookout for a saucer to go with it! I love the teacup in your Google Plus profile picture! What a wonderful package you received. I'm so sorry about the broken saucer. Hey Ashley! Nice to see you 'pop in'! The teacup exchange was so neat. Two more nice packages in the exchange. I'm glad you could participate. :-) It was too bad about the saucer, though. Indeed! It was such an awesome thing to participate in. Thank you for stopping by!